No title needed for this blog post; the picture almost speaks for itself. 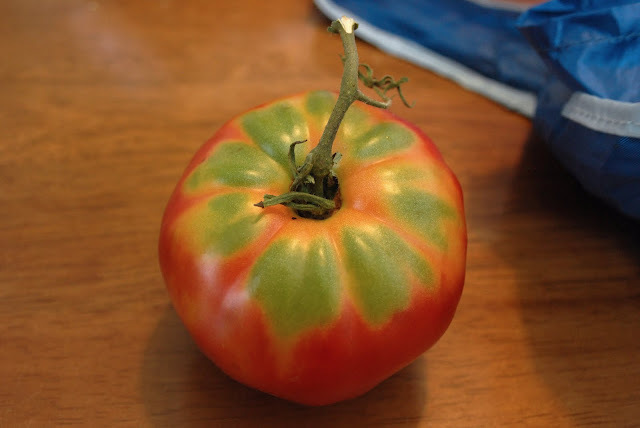 For those of you who do not speak vegetable, this is an heirloom tomato courtesy of Barry Savoie of Savoie Organic Farm. You can catch him at the Haddonfield Farmers' Market on Saturdays and at the Headhouse on Sundays. If this tomato could only last until Halloween, I would put it out as a pumpkin. Alas, it might make it until tomorrow, right up until I put it in my next Ratatouille.